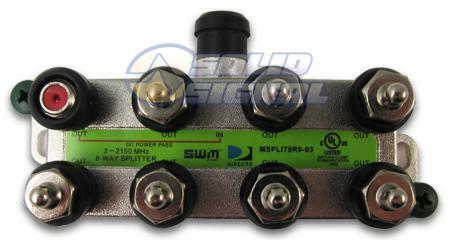 It seems like most satellite equipment has a green screw intended for a ground wire. Yet, most of the time those green screws go unused. Should you feel massive guilt pangs from not having grounded every splitter, every connector, every switch in your system? Probably not. Oh, don’t misunderstand — grounding is very important. It’s one of the most important things you can do. But it’s not necessary for a residential setup to ground every single bit. With commercial installs, most of the distribution equipment is mounted to a metal plate which is then grounded, so the entire system is grounded. With home equipment, it’s more likely to be mounted to a wall with no ground. The most important thing to ground is your dish or antenna. It’s likely to be at the highest point in your home and most prone to lightning strikes. Use a good ground block and follow the procedures in our Guide to Grounding. Make sure you’re grounding to a good source like the whole house ground or a properly placed grounding rod. Remember, a thin piece of copper isn’t going to really stop lightning from hitting, but using proper grounding procedures will help dispel static buildup that can make a lightning strike start. We also strongly recommend using a grounded surge protector (one with three prongs.) Most consumer electronics equipment uses two-prong plugs, so a grounded surge protector isn’t necessary to make them work, but grounding the surge protector will help with spikes and keep your system as stable as it can be.